Esophageal cancer is the sixth-most-common cancer in the world, and its incidence is increasing. Some three to five males are affected for each female. An "esophageal cancer belt", in which the incidence of esophageal squamous cell carcinoma (SCC) is more than a hundred times that of adjacent areas, extends from northeastern China through central Asia to northern Iran. Ethiopia also has a notably high incidence. There are two main types of esophageal cancer—adenocarcinoma and squamous cell carcinoma. Worldwide, the incidence of each type is about the same, but in developed countries like North America and Europe adenocarcinoma is the more common. A ‘‘ﬁeld defect’’ or ‘‘field cancerization’’ is a region of tissue that precedes and predisposes to the development of cancer. Field defects occur in progression to gastrointestinal tract cancers. These field defects may contain visible gross manifestations, epigenetic alterations and/or mutations. Adenocarcinomas of the esophagus tend to arise in a field defect called Barrett's esophagus, a red patch of tissue in the generally pink lower esophagus. A diagnosis of Barrett’s esophagus is confirmed by a metaplastic change of the esophageal mucosa from squamous to columnar mucosa with intestinal metaplasia. Barrett's esophagus is the dominant pre-malignant lesion of esophageal adenocarcinoma, and has prevalent epigenetic alterations. Esophageal squamous-cell carcinomas may occur as second primary tumors associated with head and neck cancer, due to field cancerization (i.e. a regional reaction to long-term carcinogenic exposure). A field defect associated with progression towards squamous cell carcinoma can be identified with epigenetic markers. Gastric cancer develops within areas (field defects) of the stomach with atrophic gastritis and intestinal metaplasia: these lesions represent the cancerization ﬁeld in which (intestinal-type) gastric cancers develop. In one study, the field defect was clearly demonstrated in gastric carcinogenesis using miRNA high throughput data from normal gastric mucosa (from patients who had never had a gastric malignant neoplasm), non-tumor tissue adjacent to a gastric cancer, and gastric cancer tissue. Greater than 5-fold reductions were found in four miRNAs in tumor-adjacent tissues and gastric cancers as compared to those miRNA levels in normal gastric tissues. When a segment of the large intestine, containing a cancer, is removed, the area adjacent to the cancer (and removed with it) may show additional neoplasia in the form of polyps (see image). This is visual evidence of a field defect. Some of these polyps may be premalignant neoplastic tumors. As shown by Hofstad et al., when polyps are allowed to remain in the colon and are observed for three years, about 40% of polyps are seen to grow larger, likely progressing towards cancer. Luo et al. summarized the substantial body of evidence that field cancerization occurs in the colon, often due to aberrant DNA methylation. 1 2 3 4 5 Yamada T, Alpers DH, et al. (2009). Textbook of gastroenterology (5th ed.). Chichester, West Sussex: Blackwell Pub. pp. 603, 1028. ISBN 978-1-4051-6911-0. OCLC 404100761. 1 2 3 4 Bjelakovic, G; Nikolova, D; Simonetti, RG; Gluud, C (Jul 16, 2008). "Antioxidant supplements for preventing gastrointestinal cancers.". The Cochrane database of systematic reviews (3): CD004183. doi:10.1002/14651858.CD004183.pub3. PMID 18677777. ↑ "Death and DALY estimates for 2004 by cause for WHO Member States (Persons, all ages)". WHO. Retrieved 12 October 2013. 1 2 3 4 5 Yang, S; Wu, S; Huang, Y; Shao, Y; Chen, XY; Xian, L; Zheng, J; Wen, Y; Chen, X; Li, H; Yang, C (Dec 12, 2012). 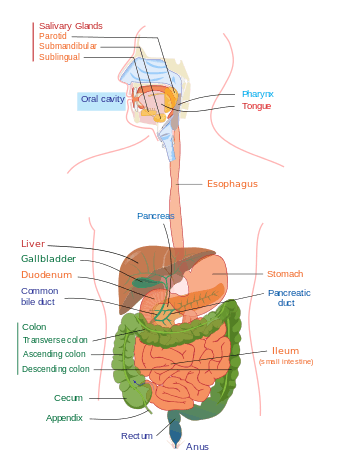 "Screening for oesophageal cancer.". The Cochrane database of systematic reviews. 12: CD007883. doi:10.1002/14651858.CD007883.pub2. PMID 23235651. ↑ Bennett, C; Wang, Y; Pan, T (Oct 7, 2009). "Endoscopic mucosal resection for early gastric cancer.". The Cochrane database of systematic reviews (4): CD004276. doi:10.1002/14651858.CD004276.pub3. PMID 19821324. 1 2 O'Connor, A; McNamara, D; O'Moráin, CA (Sep 23, 2013). "Surveillance of gastric intestinal metaplasia for the prevention of gastric cancer.". The Cochrane database of systematic reviews. 9: CD009322. doi:10.1002/14651858.CD009322.pub2. PMID 24062262. 1 2 3 Arcidiacono, PG; Calori, G; Carrara, S; McNicol, ED; Testoni, PA (Mar 16, 2011). "Celiac plexus block for pancreatic cancer pain in adults.". The Cochrane database of systematic reviews (3): CD007519. doi:10.1002/14651858.CD007519.pub2. PMID 21412903. 1 2 3 Moss, AC; Morris, E; Mac Mathuna, P (Apr 19, 2006). "Palliative biliary stents for obstructing pancreatic carcinoma.". The Cochrane database of systematic reviews (2): CD004200. doi:10.1002/14651858.CD004200.pub4. PMID 16625598. 1 2 Gurusamy, Kurinchi Selvan; Kumar, Senthil; Davidson, Brian R; Fusai, Giuseppe; Gurusamy, Kurinchi Selvan (2012). "Resection versus other treatments for locally advanced pancreatic cancer". doi:10.1002/14651858.CD010244. ↑ Gurusamy, Kurinchi Selvan; Allen, Victoria B; Kalia, Amun; Davidson, Brian R; Gurusamy, Kurinchi Selvan (2011). "Diagnostic accuracy of laparoscopy for assessing the resectability in pancreatic and periampullary cancer". doi:10.1002/14651858.CD009323. ↑ "Gastrointestinal Carcinoid Tumor". National Cancer Institute at the National Institutes of Health. Retrieved 15 October 2013. ↑ Bernstein C, Bernstein H, Payne CM, Dvorak K, Garewal H (2008). "Field defects in progression to gastrointestinal tract cancers". Cancer Lett. 260 (1-2): 1–10. doi:10.1016/j.canlet.2007.11.027. PMC 2744582 . PMID 18164807. ↑ Halland M, Katzka D, Iyer PG (2015). "Recent developments in pathogenesis, diagnosis and therapy of Barrett's esophagus". World J. Gastroenterol. 21 (21): 6479–90. doi:10.3748/wjg.v21.i21.6479. PMC 4458759 . PMID 26074687. ↑ Priante AV, Castilho EC, Kowalski LP (April 2011). "Second primary tumors in patients with head and neck cancer". Current Oncology Reports. 13 (2): 132–7. doi:10.1007/s11912-010-0147-7. PMID 21234721. ↑ Scherübl H, Steinberg J, Schwertner C, Mir-Salim P, Stölzel U, de Villiers EM (June 2008). "'Field cancerization' im oberen Aerodigestivtrakt" [Coincidental squamous cell cancers of the esophagus, head, and neck: risk and screening]. HNO (in German). 56 (6): 603–8. doi:10.1007/s00106-007-1616-7. PMID 17928979. ↑ Lee YC, Wang HP, Wang CP, Ko JY, Lee JM, Chiu HM, et al. (2011). "Revisit of field cancerization in squamous cell carcinoma of upper aerodigestive tract: better risk assessment with epigenetic markers". Cancer Prev Res (Phila). 4 (12): 1982–92. doi:10.1158/1940-6207.CAPR-11-0096. PMID 21952583. ↑ Rugge M, Capelle LG, Cappellesso R, Nitti D, Kuipers EJ (2013). "Precancerous lesions in the stomach: from biology to clinical patient management". Best Pract Res Clin Gastroenterol. 27 (2): 205–23. doi:10.1016/j.bpg.2012.12.007. PMID 23809241. ↑ Assumpção MB, Moreira FC, Hamoy IG, Magalhães L, Vidal A, Pereira A, et al. (2015). "High-Throughput miRNA Sequencing Reveals a Field Effect in Gastric Cancer and Suggests an Epigenetic Network Mechanism". Bioinform Biol Insights. 9: 111–7. doi:10.4137/BBI.S24066. PMC 4496000 . PMID 26244015. ↑ Hofstad B, Vatn MH, Andersen SN, Huitfeldt HS, Rognum T, Larsen S, et al. (1996). "Growth of colorectal polyps: redetection and evaluation of unresected polyps for a period of three years". Gut. 39 (3): 449–56. doi:10.1136/gut.39.3.449. PMC 1383355 . PMID 8949653. ↑ Luo Y, Yu M, Grady WM (2014). "Field cancerization in the colon: a role for aberrant DNA methylation?". Gastroenterol Rep (Oxf). 2 (1): 16–20. doi:10.1093/gastro/got039. PMC 3920999 . PMID 24760232.